After five days living out of this innovative pack in the Canadian Rockies, I became a believer, and since then the Exos has proven itself to be durable as well. Its lightweight and comfort impressed me as much as its technical innovations, even though I was at the upper limit of its recommended weight range. I love the simplicity of this top-loader even after carrying 30-plus pounds over 40 miles. There are no mid-panel zippers or other unnecessary gee gaws to add weight, but there are nine exterior pockets, a unique "stow on the go" system for carrying your trekking poles, and double tool attachments. At just two and a quarter pounds, and with an innovative tension mesh back panel, it was the comfort and ventilation of this pack that stood out. The waist belt tightens with an easy to use "Ergo Pull" system, and unique compression straps keep your gear securely lashed in the mesh side pockets. 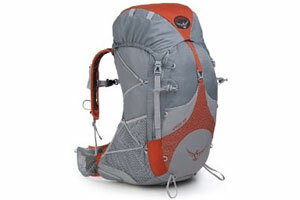 We're accustomed by now to high-performing packs from Osprey, but this one exceeds even those high expectations. People tend view this as a weekend bag, but with backcountry gear getting lighter and less bulky, the 58-liter capacity and 35-pound load limit for the Exos can easily give you four to five days in the wilderness, and do so in unparalleled comfort.